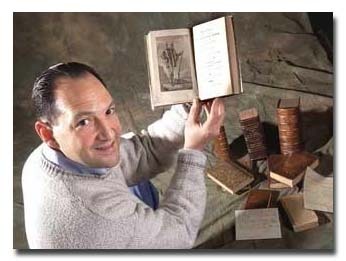 When Manuscript Society member Chris Kortlander placed his 1815 edition of the Lewis and Clark Journals up for sale on eBay at a minimum starting bid of $250,000, he did so with all the separation anxiety common to the seasoned document dealer reluctant to part with his wares. The 3-volume set was once the personal copy of its editor, Nicholas Biddle, the famed Philadelphia attorney and financer, who served as both the first director and first president of the Bank of the United States. Along with the contemporary drawings of the explorers the editor glued in the preface, Biddle’s signature appears twice. 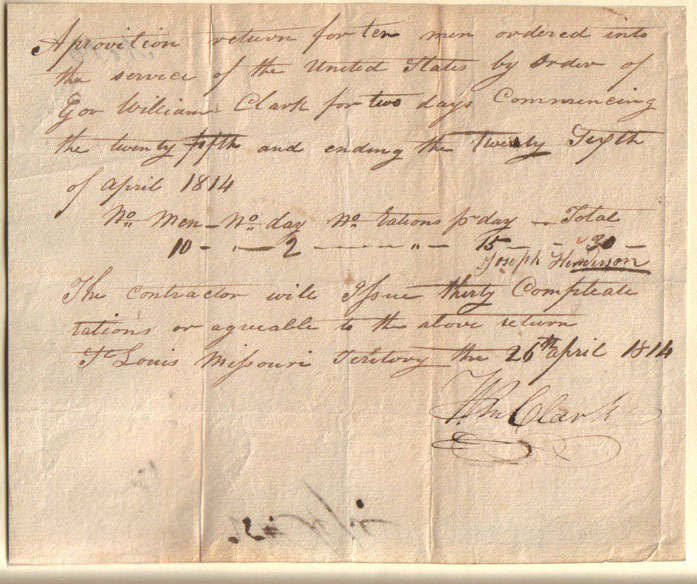 Two documents concealed within the pages respectively carry the signature of William Clark and Biddle, during his official tenure as president of the U.S. Bank. 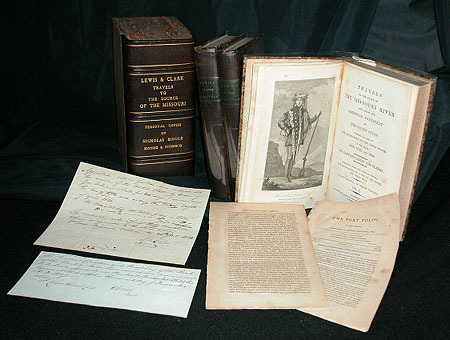 Kortlander, who owns Historical Rarities, Inc. and the Custer Battlefield Museum at Garryowen, Montana, advertised the unique set as a means of informing scholars and collectors of its existence. Unless a hungry buyer is willing to meet the posted price, Kortlander is willing to allow legitimate scholars access to the volumes. He is also contemplating a traveling exhibit centered up on the London published journals and other rare books generated by Lewis and Clark’s eventful trek across the continent, including a set of the original American edition published in the United States in 1814, an 1811 edition of the journal by expedition member Patrick Gass and an unauthorized version hashed together by Hubbard Lester from letters written by the explorers and reports drafted by other sources. After Meriwether Lewis committed suicide in 1809, the task of publishing the official journals fell to William Clark, who lacked the literary talent and time necessary to usher the task to fruition. He turned the project over to then 26-year old Biddle, who was at that time widely celebrated for his skills s a writer and poet. Biddle used the explorers’ notes to craft the text, then submitted the manuscript to Philadelphia journalist Paul Allen for final editing. Although Biddle did not receive author or editor credit in the published edition of Travels to the Source of the Missouri River and Across the American Continent to the Pacific Ocean, an engraving of his likeness is included in the book. Most of the work on the narrative was completed by 1811, but the printer’s bankruptcy woes and the onslaught of the War of 1812 delayed publication of the first American edition until 1814. The first 2-volume set sold for $6.50. For an additional $1.50, the purchaser received a fold out map. Only 1,417 copies were issued in the initial run, but even that scant number proved superior to the need. Far too much time had elapsed between the original adventure and the published account for the public to appreciate the volume in any light other than as a travel guide. Although Kortlander is uncertain about the number of copies printed of the 1815 edition, he is confident that Biddle’s original ownership and customization of the set in his possession carries a built in price support. Biddle had not so mysteriously scored “bankproofs” of the explorers’ likenesses, which he pasted in the preface. Since the United States had yet to evolve a uniform currency, it is entirely likely that famed engraver Jonas Toppan’s designs appeared on paper notes issued in one or more of the territories. Along with the April 26, 1814 William Clark document authorizing a contractor to issue rations to ten men and the Biddle document dated December, 1837, the editor saved newspaper clippings and reviews of the British version from August of 1814. The 3-volume set and its colorful appendages fell into obscurity after Biddle’s death in 1844. Nearly a century and a half passed before their next recorded public appearance. Kortlander purchased the set sometime in 1989 or 1990 from an east coast antique dealer who also dabbled in rare books. Although he is reluctant to reveal the actual price he paid for the handsome trilogy, he confesses the figure was far below their actual market value. In 1993, Kortlander came close to losing the treasured volumes to the whim of Mother Nature. He was living in Malibu, California in a restored house owned by his great-uncle, when wildfire swept through the canyon, reducing the house and document collection with an estimated value at $320,000 to ashes. Kortlander retrieved the journals in the nick of time and entrusted them to an assistant, who drove them to safety just as a wall of fire engulfed the entire neighborhood. Kortlander had already purchased the town of Garryowen near Little Bighorn Battlefield in Montana prior to the tragedy. He remained in California long enough to reconcile his losses, then moved to his new home, with the 3-volume set in tow. Because he believes the journals to be the most significant discovery of Lewis and Clark material since a few Clark documents were unearthed in an attic in St. Paul, Minnesota in 1953, he is without regrets that no buyer stepped forth to meet his inflated price.